Amouage has put out some great work under the creative direction of Christopher Chong. With his innate ability to pair the traditions of classic French perfumery with artistic inspirations from the worlds of opera and dance (amongst many others), he has a flair for bringing out the best in the perfumers he works with, drilling down into their talent to create symphonically beautiful fragrances that range from the staggering to the bizarre. Amouage may have started as a house steeped in Middle Eastern tradition, but Chong has made it an international brand that absorbs a multitude of cultures from a wide variety of places. One of the most intriguing aspects of the brand is the Library Collection, which houses a number of ‘opuses’ (now nine in total) that present compositions that celebrate ingenuity, the search for knowledge and the arts. The range from the wispy and ethereal violet of Opus III, to the harsh cracked, black leather of Opus VII, with a whole world in between. The collection strikes me as a space where all that matters is the composition and the inspiration behind it. The scents don’t need to find a huge audience and can therefore, be as unique and challenging as they need to be. It’s a refreshing direction from such an established house. 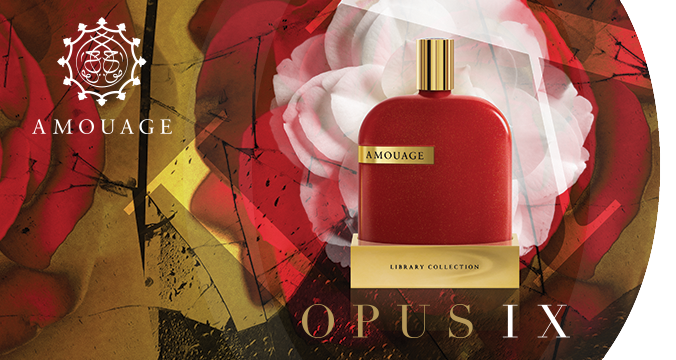 This year, Amouage is adding Opus IX to the collection. Inspired by La Traviata, the fragrance is described as a “soulful interpretation of the camellia flower”¹. In all honestly (and I could be being totally ignorant – stranger things have happened), I’ve not known camellias to have much of a fragrance however, they do have a wonderfully showy and flamboyant appearance, and Opus IX captures this bravado in a brightly coloured fragrance that utilises unusual ingredients. Opus IX opens spicy, fresh and fleshy. The black pepper is immediately there, casting a silvery cloud over the composition. Following this initial blast, the next impression is of a fresh flowers with white fleshy petals and green stems. Surprisingly, this tropical bloom has an unusual banana-like vibe, evoking the idea of the pulped pith of the freshly ripened yellow fruit. The opening is vibrant and effervescent in a way that is almost surprising for Amouage. It feels perfect for a blindingly hot day. The jasmine strikes a similar tone to Opus VIII in the sense that it is golden, hot and breath-like. That said, it takes more of a backseat in this particular opus, which centres more on the interplay of flowers and spice. In the heart, the flowers take on a honeyed characteristic and they feel almost piquant and chilli-like when smelled with the overt vivacity of the pepper. What’s really amazing is how translucent and diffusive the whole thing is. Never once does it feel heavy or oppressive. Opus IX becomes warmer in the base and treads more familiar Amouage-territory, specifically the classic tones of leather and incense. So many of the Amouage fragrances feel golden, and Opus IX is no exception. There is a richness to the base that is sweet, warm and ever-so-slightly beastly. Vetiver goes along way to cut strips into the warmth of the base, ensuring that the richness is divided by green earthiness and a touch of something slightly salty. Coming after the alien amber of Opus VI, the rebellious biker leather of Opus VII and the velvet curtain of jasmine that is Opus VIII, Opus IX casts a more subtle and laid back impression. It’s certainly less bold in terms of olfactory shock value, but not every scent needs to make a gigantic statement, and Opus IX’s flamboyant and carefree tone is actually what makes it so charming. Opus IX wears beautifully in the heat too, soaking in the sun and exploding it back out in heaps of pepper and honeyed flowers. I find it to be a thoroughly enjoyable fragrance to wear. Opus IX is available in 100ml Eau de Parfum for £235. Sample via Amouage. Notes via fragrantica.com. Image 1 via thegoodmellasblog.blogspot.com. ¹ via nstperfume.com. Posted in Amouage, Floral, Perfume Reviews and tagged Amouage, Christopher Chong, Library Collection, Opus, Opus IX, The Library Collection. Bookmark the permalink. Can’t wait to try it, Amouage is one of my favourite brands! 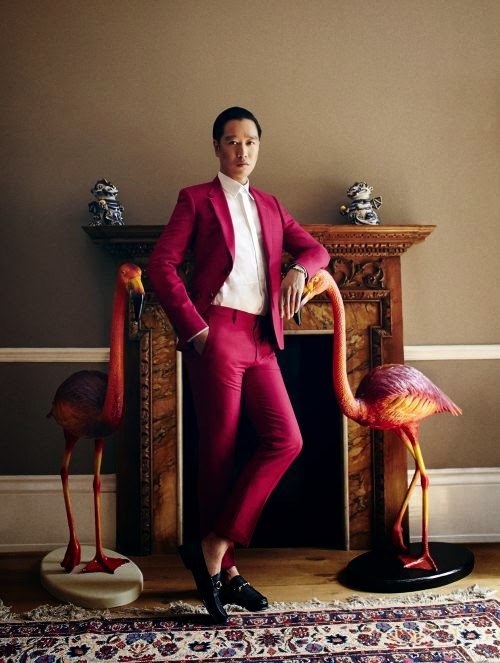 On a whole other note, how incredibly dashing does Mr. Chong look in that picture?! Mine too! He looks rather spiffy there, doesn’t he?